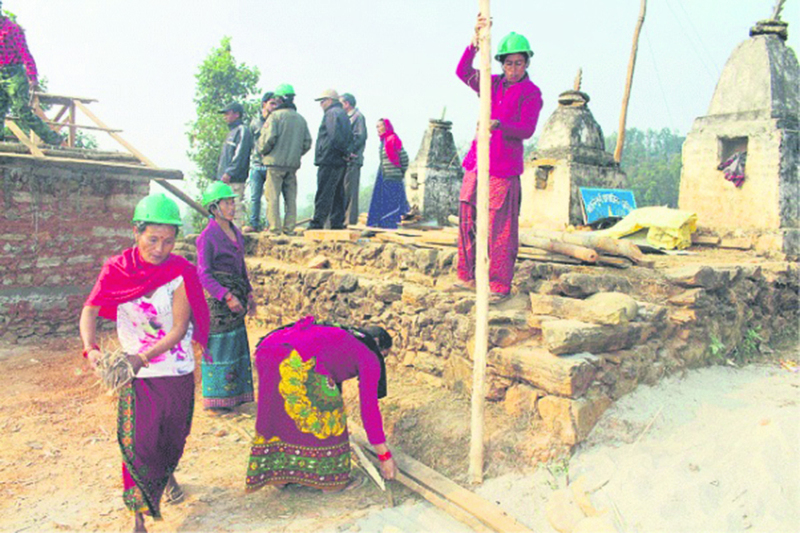 Narahari Sapkota/Republica Women in Khoplang village of Gorkha learning how to build an earthquake resistant house in this file photo. GORKHA, Dec 23: On 25 April 2015, the country witnessed an unexpected disaster. Human lives, cattle, and infrastructures were destroyed by the 7.8 magnitude earthquake. The epicenter of the earthquake was Gorkha. Unsurprisingly, it was devastated beyond words. Over the years, most of the places have been gradually rising from the rubbles. However, the rate of revival varies from place to place. Gorkha, which among others, lost its thriving homestay service to the earthquake, is struggling hard to revive the business. Stakeholders lament that it is unlikely to revive even in the future. As the aesthetics of our houses have been destroyed during the reconstruction process, there is nothing left to attract foreigners to our homes for staying with us. Our traditional homemaking art is lost to modern construction. -- Man Bahadur Rana, Gorkha Municipality - 5. Renovated or newly built houses, hotels, and restaurants do not carry the authentic look for which the homestay was popular. It has lost its texture. "We are extremely worried about it. The reconstruction was done by the government and during the process, we adopted to the designs put forth by the government agencies. But in the process we have lost the original form of our homes," laments Man Bahadur Rana, a homestay operator in Paslang area, Gorkha Municipality - 5. "The new buildings and other infrastructures don't look good though they might be strong and resistant to earthquake." During an interaction program organized by the Federation of Nepalese Chamber of Commerce and Industries at Paslang on Saturday, homestay operators expressed concerns that their businesses might not start even in days to come. "The very foundation on which the business stood has been destroyed," they said. The government had prescribed certain house models to select from for reconstructing houses. Those who have received house grant from the government to build a new house have been warned to return installments if they are not following its construction guidelines. Along with that, public infrastructures in the district have been built using the government mandated designs. "While designing houses, government agencies only considered safety measures. But in doing so, they neglected the aesthetic values that infrastructure should carry with them," states Rana. "Tourists used to come here for homestay due to the unique structures of our houses, and our lifestyles. We should have protected them." "As the aesthetics of our houses have been destroyed during the reconstruction process, there is nothing left to attract foreigners to our homes for staying with us. Our traditional homemaking art is lost to modern construction." For months, people in Gorkha were still under the shock including Rana. It took a lot of time for their lives to return to normalcy, he says. "The pain and the chaos were too big to overcome. That was an extremely huge disaster." Locals in the Nepali New Year last year (April) decided to give homestay service a try again. With whatever resources they had, they started operating services. However, over the time they have now realized that the reconstruction has not helped them much. Serving best food or offering cultural dances alone are not making the tourists stay longer. "They want to live in a different house, the ones which we used to have," Rana stated. After starting the homestay campaign in April, the operators have met several tourism officials urging them for promoting homestay in Gorkha. They lamented that though homestay services were available in villages not far from the district headquarters, few tourists were stepping in. "We thought that we should promote our place. Even earlier, there was need of such advertisement, but after the earthquake, telling the world about the revival in Gorkha became even more pertinent," Rana stated. 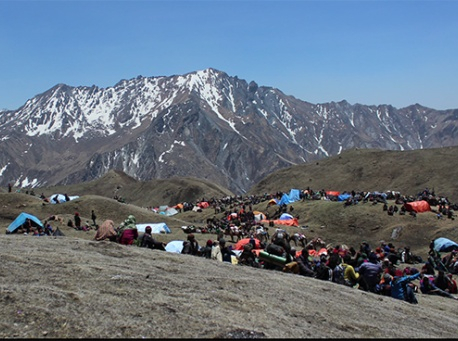 Gorkha attracts culture and nature lovers due to its landscape and indigenous communities. Pashlang is home to Magar families. There are other villages which lure visitors for several other reasons. "Naamrung temple, Children's park and the roads should be upgraded to bring in more tourists," said Rana. The locals are planning to build the necessary infrastructure to bring back the artistic look to their villages and home. Other plans are in the pipeline to convert the entire Pashlang village into a homestay village. According to the chairperson of FNCCI, Gorkha, Jiven Jyoti Shrestha, the district committee is presently in discussion over ways to transform the entire village and even other parts of Gorkha into a tourism hub. "As per our 'One Village, One Produce' campaign, we are launching homestay as a product. We are making every effort to bring in more and more tourists here and make their stay longer," said Shrestha. "After the reconstruction, we have noticed a few shortcomings and are trying to overcome them while moving ahead cautiously." Gorkha Municipality has allocated Rs one million for tourism promotion this fiscal year, according to its Mayor, Rajan Raj Panta. There are many areas which need the government's attention, but the budget is limited, he said.